Diversity's Perri Kiely was crowned Splash! 2014 champion with a whopping 60.97% of the viewers' vote, ITV has revealed. Diversity star Perri Kiely was crowned champion of ITV's celebrity diving show Splash! 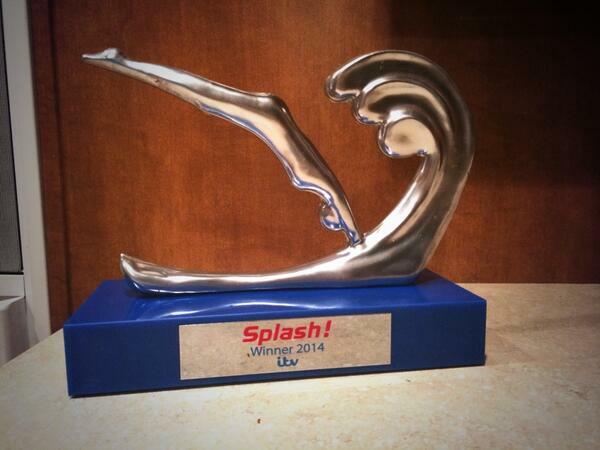 Perri Kiely has posted a picture of his trophy after the 18-year-old dancer for Diversity won Splash! tonight. The hosts and star judges of this year's Splash! celebrated the end of the series by jumping into the pool. After Diversity star Perri Keily was crowned champion, hosts Vernon Kay, Gabby Logan, jumped into the pool fully clothed, along with Tom Daley, and judges Jo Brand, Andy Banks and Leon Taylor. Diversity 'proud of bro' Kiely after winning Splash! Dance troupe Diversity have congratulated Perri Kiely after he was crowned champion of Splash! Yeeeeeeesssssssss!!!! He's won it ????? thanks to very one who voted we love you all.. ???? sooo proud of our lil bro @realperrikiely ?? Diversity's Perri Kiely has been crowned the champion of this year's Splash!. Paralympic gold medallist Richard Whitehead and The Only Way is Essex star Dan Osborne have secured a place in next week's final. Street dancer Perri Kiely flipped his way into the Splash! finals after performing two sensational dives on the celebrity show. See more: Michaela Strachan bombs out of Splash! See the latest from Splash! Michaela Strachan bombs out of Splash!